There are lots of reasons an author may write under a pen name. Maybe they want some anonymity or to create some disconnect from family members; perhaps they find themselves exploring controversial ideas and want to avoid confrontation; maybe a bird (or other mystical creature) whispered in their ear or came to them in a dream; perhaps it’s just a stage name that is more marketable or palatable to the public. Whatever the reason, it comes downs to creating a separation from the private person and their public perception. It seems to me that many people—in the age of reality TV—have become confused about this. In my own life, I have had people conflate my fictional characters and satirical writing under a pen name with my private self or views, confusing things in an autobiographical fiction book with my “real” self or wanting to argue over a blog or essay that presents a political or social view they disagree with. This is so strange to me because it seems they cannot fathom that they are actually arguing with divergent parts of themselves, not me. I presented something to make people think, and they showed that their thinking is chaotic and argumentative. I’m not part of that chaos, and you can’t know a writer through what they write. A pen name used to be a vehicle to create some separation, to get a person to realize that a writer is playing a role as a teacher or discussion starter. But now that seems lost because—here in America at least—so few people learn about the arts. It’s getting scary, so I guess it best to explain a little about how I look at my pen name. 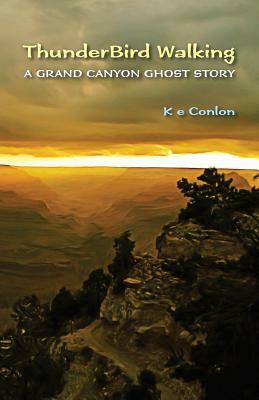 My pen name (K E Conlon) draws from my Irish maternal roots. I remember as a boy sometimes getting corrected by teachers for using the UK English spellings of words and placing commas outside of quotes. I’m not sure where this came from exactly, perhaps generational memory. (I have both English and Irish ancestors.) I remember protesting the idea that a comma went inside a quote because it wasn’t (always) technically correct, but I’d be chastised for not following American grammar rules. Later, when I learned the way that UK English handled quote punctuation (and it matched what I did) I felt vindicated. So my pen name, in part, plays homage to those Irish writer roots. Beyond that, I write some mystical horror and government intrigue stuff even though I’m not a big conspiracy believer kind of person. Early in my writer days I attracted a certain conspirator element to my blogs, and it felt like I could be taken down a path. When I changed my first book from a memoir to autobiographical fiction, I pushed some of the more esoteric ideas that ran through my mind into the character’s reality—things that were treated as off-the-track delusions in the memoir. The novel is written in first person, so by definition the TBW character cannot have the ability to see himself moving through his life. His delusions become more real, the struggle more heightened, and he ultimately becomes an unreliable narrator. The greatest difference between the TBW character and me is in my ability to have third-person awareness of myself. It’s strange to realize that people not only conflate the character in the book with me, but seem to think that my pen name is some alternate personality type of thing. I surpassed the limits of psychology a long time ago, and I don’t know how to explain that to someone who still clings to it. The Greeks didn’t have a pseudoscience called psychology. Instead, they studied the “psyche” through theatre—the role playing arts. The storyteller or writer existed outside of the story, above the story like a creator. In that way they could look at their own crazy thoughts but not take them into themselves. In more modern times—with the rise of modern theatre and movies—there was a saying, “Don’t believe your own press.” This meant, in part at least, that the great things your publicist says about you, the personal brand they create, don’t believe in it. When I got my masters in film, I learned that the way an actor or writer keeps their sanity is too keep boundaries between their private self, their personal brand (their talk-show self), and their professional brand (the characters they create). Reality TV confuses this as people now present their private self as their personal brand and their professional brand. It just seems so messed up—a recipe for emotional disaster and plenty of rehab. So I use a pen name to pay homage to my Irish roots and separate myself from people who don’t quite get how the arts work. I’m aware I explore some fairly deep and dark territory, but I don’t do so as “therapy” or to fix my psychology. The arts aren’t like that, at least not the way I learned them. Writing is a discussion, not a therapy session…. I hope we can relearn that.